Marin brewring definitely did a great job combining two great beer types and giving it a California kick. This beer has the great qualities of a traditional hefeweisen (citrusy, wheaty, sweet) with those of a doppelweisen (more wheaty, stronger, significant mouth feel). 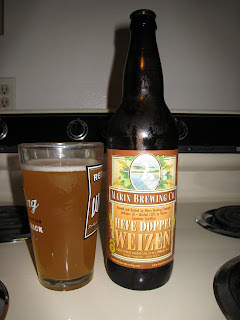 The hefeweisen part lulls you into drinking more while the doppelweisen punches you in the mouth with the 7%, an unheard of amount for a hefe. It's the same a drinking an 8% natty. Absolutely refreshing.